Like anything computer related WordPress can have problems that arise. Fixing problems is quicker, easier, and less frustrating when you have help or can use other experiences as a resource. Obviously, the best place start your search for help is on the WordPress website. Although, these are not always the fastest ways to resolve issues. Especially if they are server or database related. WP Engine – They specialize in only WordPress hosting which means their staff is well versed in using WordPress. Each technician has a profile and picture to go along with their emails. This personalizes the support which makes it more friendly. Site5 – Also has a email service that has a profile and picture of the technician that is working with you. 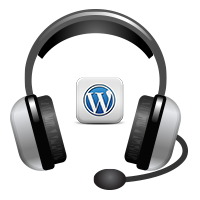 They often can help solve WordPress issues. When it comes to hosting, Site5 does a great job keeping their customers happy. HostGator – Provide excellent support services. Anytime we have issues we are able to resolve them in their first level of tech support. It helps us trust their service and makes us feel like we can call them back anytime. Do you see an error code? Try Googling it.